In honor of the 41st president, George H.W. Bush who died at age 94 Friday night, the country will observe a National Day of Mourning on Wednesday, December 5. 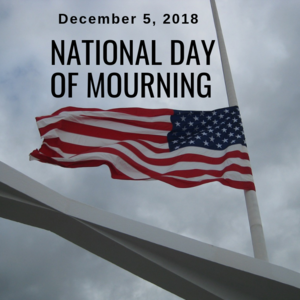 "I do further appoint December 5, 2018, as a National Day of Mourning throughout the United States. I call on the American people to assemble on that day in their respective places of worship, there to pay homage to the memory of President George H.W. Bush. I invite the people of the world who share our grief to join us in this solemn observance." Various federal, state and local government offices will be closed including the U.S. Postal Service*, All Federal offices, New York Stock Exchange, Nasdaq, some banks and courts. The Supreme Court is postponing arguments for a day. The House canceled votes. The Senate postponed votes until after the funeral Wednesday. *The US Postal Service will have limited package delivery to avoid setbacks during the busy holiday season. Prior to making a visit to a government office or a place of business, you may wish to call ahead to verify that they are opened.